Snow Foam Combo 2 has been designed for the ‘Preparation’ stage of valeting. The thick foam enables deep cleaning and degreasing of the paint surface, clinging to and removing tra c lm and other contaminants, readying the car for the final, shampoo wash stage. 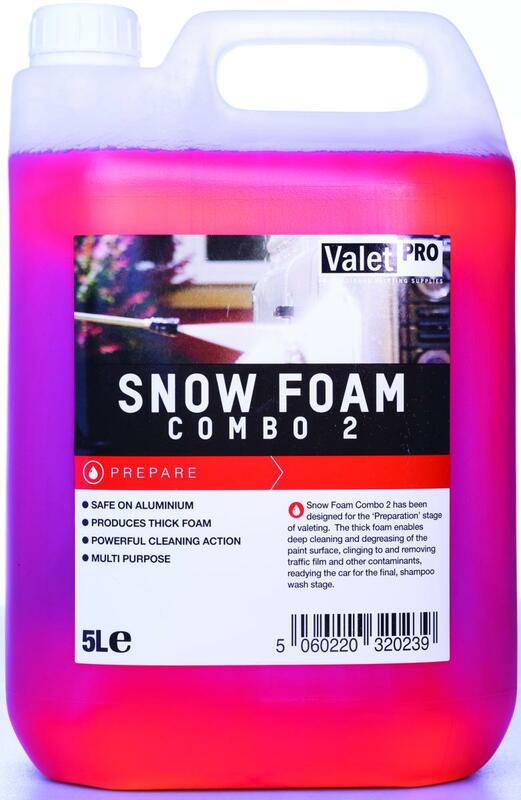 Snow foam lance - pre-dilute to suit foaming system. End dilution 1:300.
create a suitable thickness of foam. Foam vehicle starting from the bottom to top, cover entire vehicle. Allow to dwell for 5 minutes, make sure product does not dry out, rinse thoroughly from bottom to top. Pump spray - Dilute 1:10 for heavy soiled vehicles. 1:15 for lightly soiled vehicles. Spray lower area of vehicle where most soiling occurs. Rinse thoroughly with a pressure washer starting from the bottom and working up. Wheel cleaning - Use neat to a dilution of 1:5. Spray on wheels, allow to dwell for 5 minutes, do not allow to dry, rinse thoroughly. If needed reapply, then agitate with soft brush. Rinse thoroughly. Causes severe skin burns and eye damage. Precautionary Statements: Wash hands thoroughly after handling. Wear eye protection, protective gloves. IF SWALLOWED: rinse mouth. Do NOT induce vomiting. IF ON SKIN (or hair): Remove/take o immediately all contaminated clothing. Rinse skin with water/shower. IF IN EYES: Rinse cautiously with water for several minutes. Remove contact lenses, if present and easy to do. Continue rinsing. Get immediate medical attention. Store locked up.